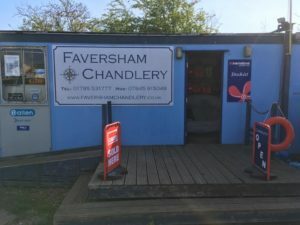 We are delighted to announce that Faversham Chandlery, Iron Wharf Boat Yard, Abbeyfields, Faversham ME13 7BY have joined our growing list of stockists. Mark now has a range of lightbulbs including the very popular BAY15D for Navigation Lights to Complete Cabin lights, for all of your Lighting requirements please visit Mark at the Chandlery open Thursday to Monday. Iron Wharf is essentially a ‘do it yourself’ boatyard where boat owners can undertake all kinds of boat building projects, large and small. For owners of traditional wood, steel, or GRP boats, Iron Wharf offers some of the finest facilities, and expertise on the East Coast. The DIY boatyard offers spacious storage ashore or mud berths and moorings alongside a traditional wharf, in a beautiful countryside setting, whilst being just a short walk from all amenities of the charming medieval market town of Faversham in Kent.